Colt is RED HOT. The youngest member of TEAM CHEROKEE, he is carving out his own place in the world of magic. 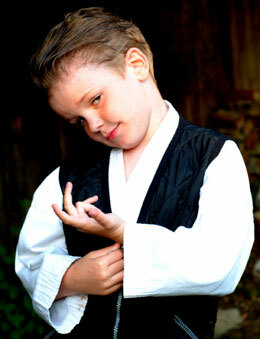 I began Colt's training at an early age.The basics: cards, karate and stagemanship. Now he's developing his own repertoire of magic that blows my mind every time I'm in town. When we believe in the children, in their power to change the future, we all benefit. Children are Magic and until we understand that we are just going to keep having the same problems we do now except only worse. "thy child is love and as love is from thy heart, so too must be thy child. Give of yourself to them and they will blossom like thy flower"
I give of myself to him and his mother every month and I hope that when he's 18 he'll remember who put the food on the table. Colt is my legacy and someday i hope to have him join me on the road as a full fledged member of TEAM CHEROKEE. Until that happens I'm going to continue his instruction just like those inner-city kids I used to mentor.